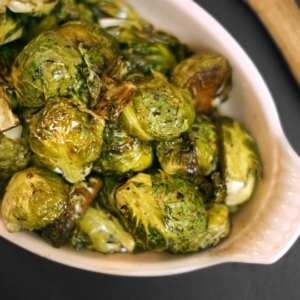 Tender on the inside, and crispy on the outside, these Brussels sprouts are a quick and easy addition to any meal. Preheat your oven to 375F. If your coconut oil is solid at room temperature, place the two tablespoons of coconut oil in a small bowl, and set it on top of the oven to warm while you prepare the Brussels sprouts. If the top of your oven isn't warm enough, you can place the bowl inside the oven for 2 minutes to melt. Slice the Brussels sprouts in half, and place them in a large bowl. Pour the balsamic vinegar over the halves, and toss well to coat. Add the melted coconut oil, and toss again to coat. Arrange the Brussels into a single layer on a baking sheet, cut-side facing down, and sprinkle generously with salt and pepper. Roast the Brussels sprouts for 25 minutes, turning the pan after 10 minutes for even browning. The sprouts are ready when they are lightly golden.